The Travelon Signature Embroidered Phone Clutch Wallet can be used as a wallet or a wristlet. The wallet comes with RFID blocking technology which prevents identity theft by stopping readers from picking up personal data from ID, credit cards, and passport. It has two card slots, a passport slot, and a currency slot, with enough room for a smart phone and lipstick. The Travelon Signature Embroidered Phone Clutch Wallet - Wineberry has many exciting features for users of all types. 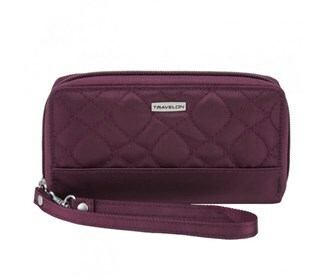 The Travelon Signature Embroidered Phone Clutch Wallet - Wineberry is sold as a Brand New Unopened Item.